This short biblical study book summarizes the New Testament and writes it in plain English, so it is easier to read and understand. I ordered this book because I thought it would be great to read aloud as a family, and it does work well for our eight year old but is still a little too wordy and mature for our five year old. I’ll hold on to this book to use in the future for family devotions. I enjoy reading the Bible in chronological order, and this narrative of the New Testament provides an easy-to-read, chronological version. The book is divided into just seven chapters, and each chapter ends with a summary of the events from that portion of Jesus’ life and legacy. The epilogue summarizes the book of Revelation in two and a half pages, so this isn’t a complete retelling of the New Testament, but it does cover the life of Jesus, which is the author’s purpose in writing The Jesus Story. 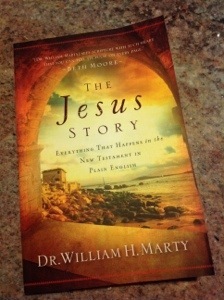 This book offers a fresh look at the story of Jesus, His ministry, and the early church. I would recommend reading it if you have already read through the New Testament to gain a new perspective.